Julien's major exhibition Playtime is on view at Fort Mason Center for Arts & Culture, San Francisco (until 11 February 2018). His celebrated 2007 work Western Union: Small Boats is on display at ARoS Aarhus Kunstmuseum (until 27 May 2018). His rarely-seen 1995 work That Rush! is part of the exhibition More of an Avalanche at Wysing Arts Centre (11 February – 8 April 2018). A number of Isaac Julien talks and screenings will take place in Sydney during February. Julien was awarded the Royal Academy of Arts Charles Wollaston Award for Western Union: Small Boats as part of the Summer Exhibition 2017. In 2017, he was appointed CBE for services to the Arts in the Queen's Birthday Honours List. 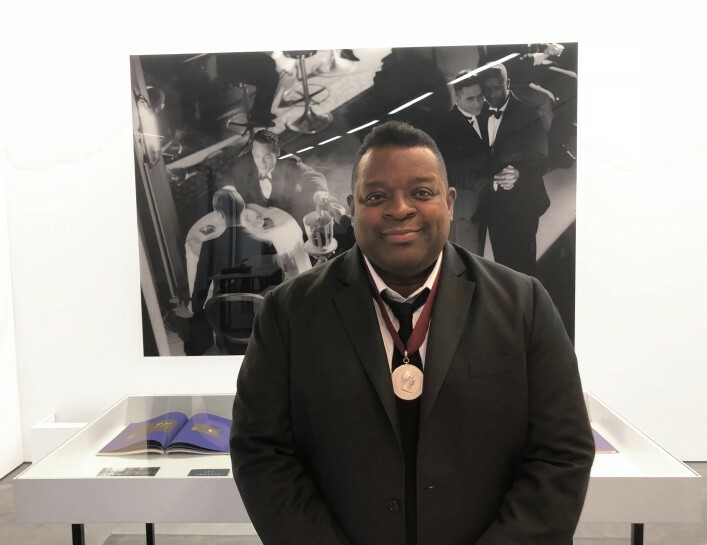 Image: Portrait of Isaac Julien in his London studio, 2018.